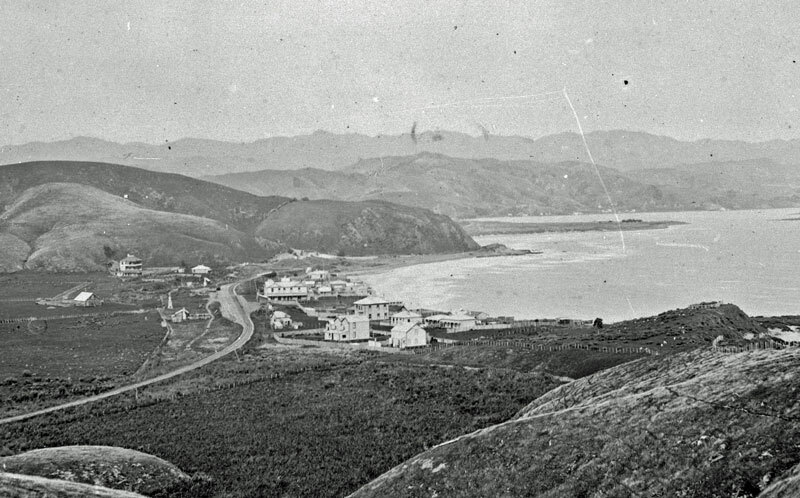 Around 1900, a rail line ran along the coast and through a tunnel under Motuhara Road. It carried boulders from Hongoeka and Karehana Bay for building streets in Wellington. The boulders were probably also used to reinforce the main rail line around Camborne Hill. 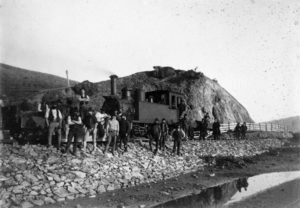 The story of the tramway and tunnel is a little known part of Plimmerton’s history. Towards the end of 1897 a Wellington contractor, Justinian John Kiverm Powell, agreed to supply the Wellington City Council with boulders from Plimmerton for use in laying streets in the city. He planned to gather these boulders from two sites: near the entrance to Hongoeka Bay and beside the point where the Plimmerton Boating Club now stands. A little tramway was designed to cart broken boulders around the coast to the railway station. 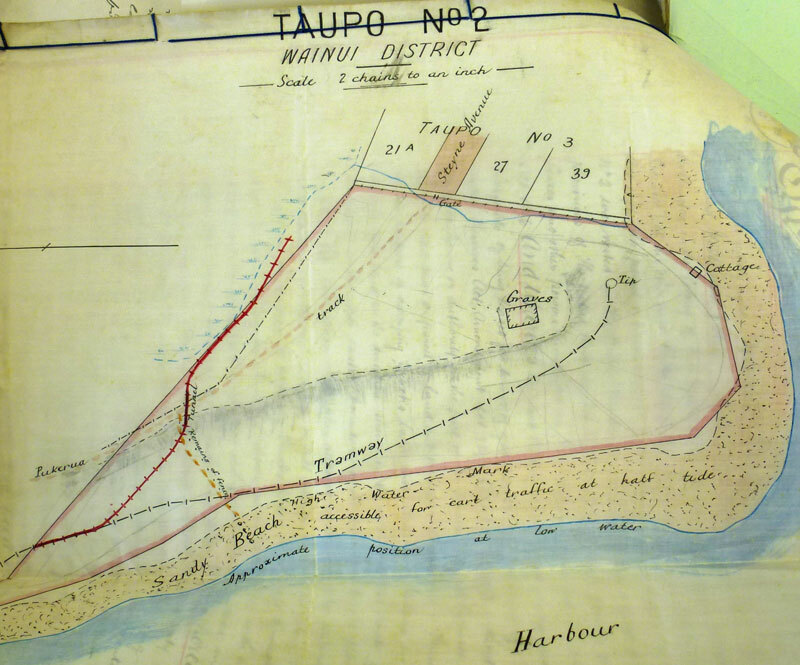 The tramway route shown in the map above was built from Hongoeka to a ‘tip’ in the Native Reserve on the point below the graves (urupa) (see Taupo 2 map below). The remaining stretch to the railway station either was never completed, or possibly had to be removed earlier. Powell struck resistance from the Public Trustee to his use of the Reserve land. So by the end of May 1898, he had dug a tunnel under Motuhara Road for his tramway. As the diversion still traversed a corner of the Reserve, Powell applied to the Public Trustee for a permit. He had already obtained James Walker’s permission to run the track from the tunnel around the edge of Walker’s swamp (which covered the current school site) to where it crossed the main railway track. From there it followed the eastern side of the main line to the station. 1898 map of tramway across the Native Reserve. In June 1898 the Public Trustee signed an agreement with Powell which allowed the tramway to cross the Reserve until the end of that year, subject to a number of conditions. These included removal of the tramway line running across the Reserve from the ‘tip’ to where it joined the line north of the tunnel, and restoring the land; building safety fences around the tunnel; and at the end of the agreement, removing the whole tramway and restoring the land in its ‘original’ state. When the permit expired in December Powell had yet to fulfil his contract with the Wellington City Council and was granted an extension. It was favourably noted that ‘pedestrians and inhabitants’ found the tramway a convenient form of transport. The tramway consisted of wooden sleepers topped with wooden 100 x 50 mm rails laid 740 mm apart. Horses pulled the loaded wooden ‘dollies’ (low-sided wagons) along the rails and through the little tunnel to the station. Over the years, hames on the collars of the horses made grooves in the ceiling of the tunnel. 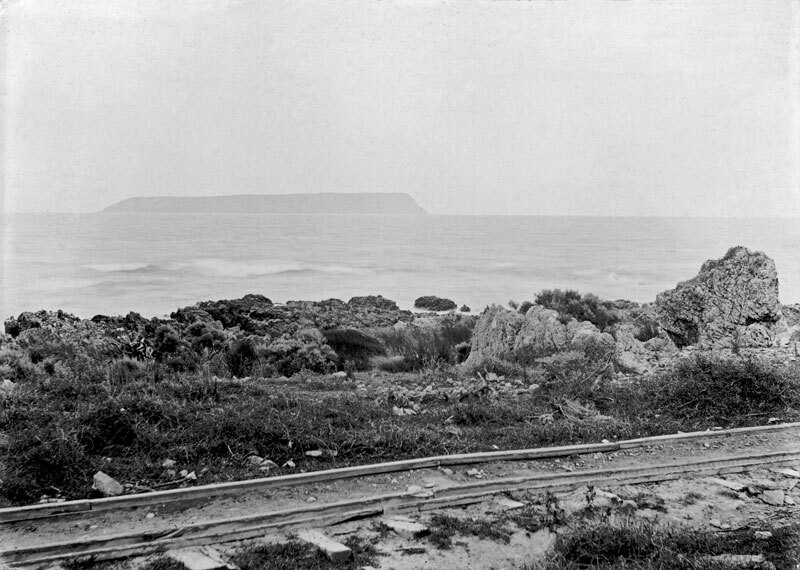 Tramway track running along the coast with Mana Island in the distance. It is said that prisoners could be seen working among the rocks on the shoreline, breaking up the boulders with their knapping hammers before their rubble was carted away. 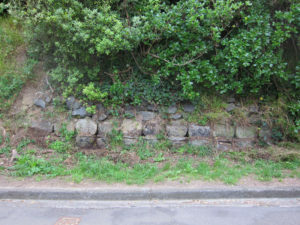 Some of the boulders may also have been used to reinforce the main railway embankment around Camborne Hill which was vulnerable to tidal erosion. Information is limited about the later period of the tramway. However, it is likely that by 1903 the boulder supply was exhausted and the line no longer used, and that Powell upheld his agreement by closing off the tunnel and removing the tramway. The western entrance to the tunnel was substantially covered when Moana Road was developed a few years later. A low wall of stones is all that remains visible. With the widening of Motuhara Road, the eastern entrance was completely lost to view. Interestingly, an unsuccessful attempt was made to find the eastern opening during World War II so that the tunnel could be used as an air raid shelter.